The Single Port Laparoscopic Surgery (SPLS) approach has recently emerged from efforts to reduce skin incisions and their related pain and morbidity. Preliminary research has indicated the need for instruments to be crossed at their point of insertion for reduction of the diameter of the single port. 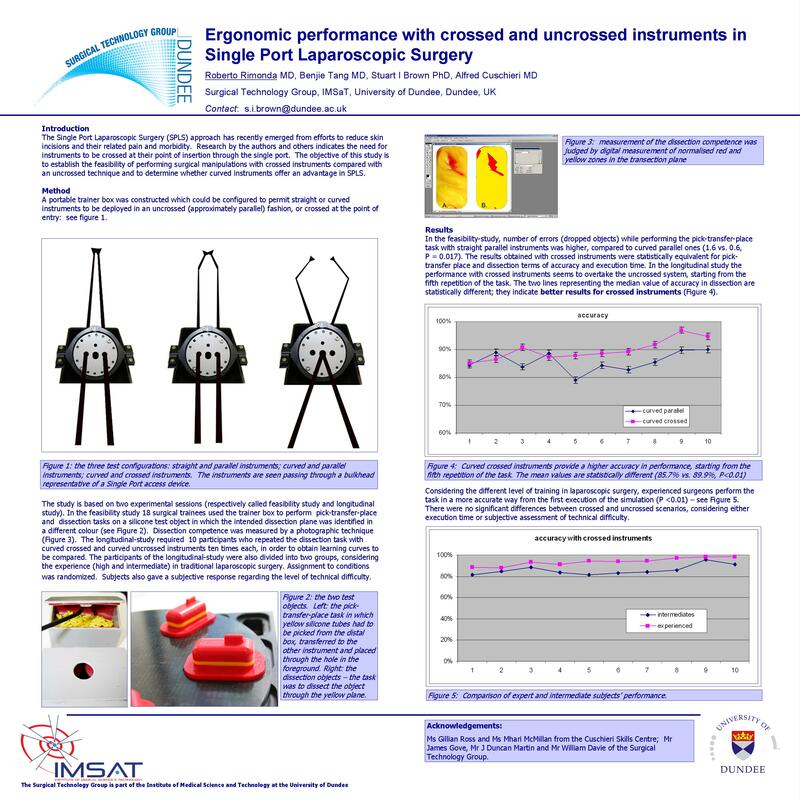 The primary objectives of this study was to compare surgical manipulations with crossed curved coaxial instruments with the traditional uncrossed instrument set up using both straight and coaxial curved instruments. The secondary objective was to identify any advantage from the use of curved coaxial over straight instruments in SPLS with the uncrossed operating set up. A portable trainer box was constructed which could be configured to permit instruments to be deployed in an uncrossed (conventional set up) fashion, or crossed at the point of entry. Eighteen surgical trainees used this box to perform a pick-transfer-place task and a dissection task on a silicon model which permitted objective assessment of the accuracy of the dissection plane. End points of the pick-transfer-place task were objects successfully placed in a 3 minute period and objects dropped. The endpoints of the dissection task were dissection accuracy (objective photographic technique), and completion time. With the uncrossed deployment scenario both straight and curved instruments were used, while manipulations with the crossed configuration were only possible with curved instruments. Assignment to conditions was randomized. Subjects also gave a subjective response regarding level of technical difficulty. There were no significant differences between crossed and uncrossed, curved or straight in the end points of the dissection task (execution time and accuracy of dissection) or in the subjective assessment of technical difficulty. The results of the present study confirm that task efficiency and quality are not compromised by use of crossed instruments during SPLS. Compared to straight instruments, curved coaxial instruments improve task performance in SPLS.